Apparently it happened in Atlanta too, where the governor waived environmental restrictions and enacted price gouging laws One well-publicized station was selling gas at well over $5 a gallon at the end of the day. Meanwhile, it’s Dawn of the Dead over in NOLA. All that’s standing before the complete breakdown of civilization are some well-prepared (and well-armed) nerds at an internet data center. There was much eating of cake and playing with presents. 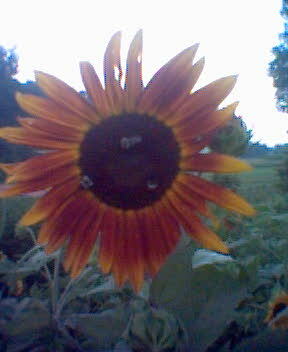 Here is one of the large red flowers with three visiting bees. For the first time, we’re growing a patch of flowers. 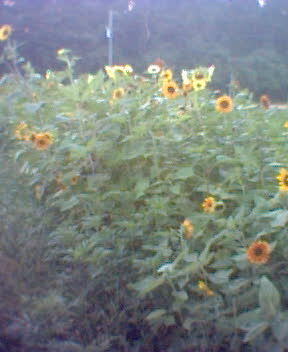 These are about 20 varieties of heirloom sunflowers.